The first step for great BBQ is to start with high-quality ribs. 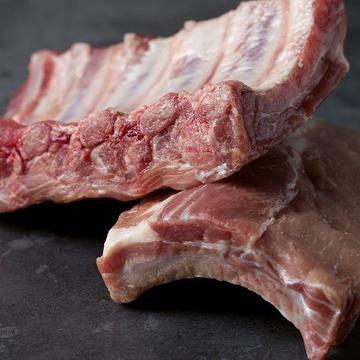 Look no further - we are proud to present these premium raw ribs, loaded with tender, juicy meat. This whole rack of uncooked back ribs is split in two for your convenience. You can do this! Start your smoker. Generously coat the ribs in your Sweet Smoky Applewood Rub and prepare to be incredibly patient while they smoke to barbeque perfection. When they're ready... aromatic and rich with flavor, you'll serve them with hearty steakhouse-style Stuffed Baked Potatoes. A sweet, gooey, crunchy and crumbly Apple Crumble Pie in its flaky crust will be the perfect ending for this all-American meal. Order now for you're all-American BBQ day. From Thawed.�Grill / Oven: Thaw in refrigerator or quick thaw by placing ribs in cold water, in the vacuum package, for approximately 30 minutes. Preheat a charcoal grill or gas grill on high. Preheat oven to 350�F. Blot dry thawed ribs with a clean paper towel and rub the seasoning into both sides of each rack of ribs. Grill covered about 5-8 minutes on each side or until the ribs are seared. Place ribs in a roasting pan and pour 3/4 cup of sauce on the racks of ribs. Add � cup of water to the pan and cover the pan with foil, crimping the edges. Bake ribs for 45 minutes to 1 hour or until ribs are tender and falling off the bone.�Omaha Steaks Beef, Pork, Lamb, Veal and Poultry have been born, raised and harvested in the USA. Do Not Thaw!�Bake: Preheat oven to 350�F. Remove twice baked potato from package. Place desired number of frozen portions on an ungreased baking sheet. Bake 40 minutes, until heated through and lightly browned.�Grill: Preheat grill. Remove twice baked potato from cellophane package. Place frozen potatoes on a sheet of aluminum foil. Wrap foil around potatoes, leaving top half exposed. Grill on medium-high heat. Cook with grill lid down for 35-45 minutes.�Microwave: Remove twice baked potato from wrap. Place one frozen potato on microwave safe dish. Cook on high for 2 � - 4 minutes rotating at half way point. To cook two potatoes, increase cooking time to 4-6 minutes. From Thawed:�Thaw in refrigerator overnight or at room temperature for 4-5 hours. If desired heated, remove plastic packaging but leave pie in foil pan. Place pie on a foil lined baking sheet. Place pie on center rack in oven. Bake pie in a preheated 350�F oven for 20-25 minutes. Rest pie 5-10 minutes before slicing and serving. Single slices can be plated and heated in the microwave for 25-30 seconds on HIGH heat.�From Frozen:�Preheat oven to 350�F. Remove pie from plastic packaging but leave pie in foil pan. Place pie on a foil lined baking sheet. Place pie on center rack in oven. Bake for 45-50 minutes. Carefully remove pie from oven and wait 5-10 minutes before slicing and serving.